Marlow’s Tavern is a bar & grill chain offering American pub fare in a classic setting with sports playing on the televisions. The menu at Marlow’s Tavern changes three times a year. We were invited to check out the new spring/summer menu at Marlow’s Tavern – Waterford Lakes (near UCF) and we really enjoyed everything we ate. 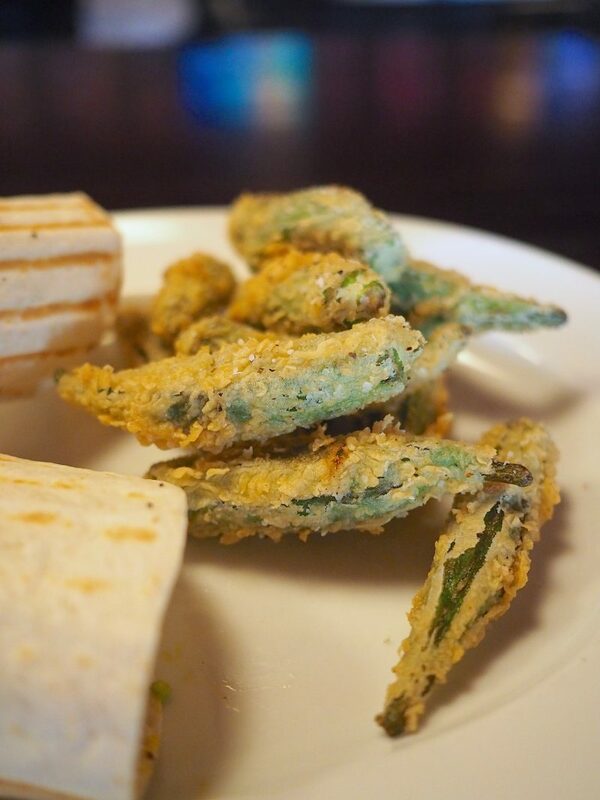 The food was delicious and the service was very welcoming and accommodating. 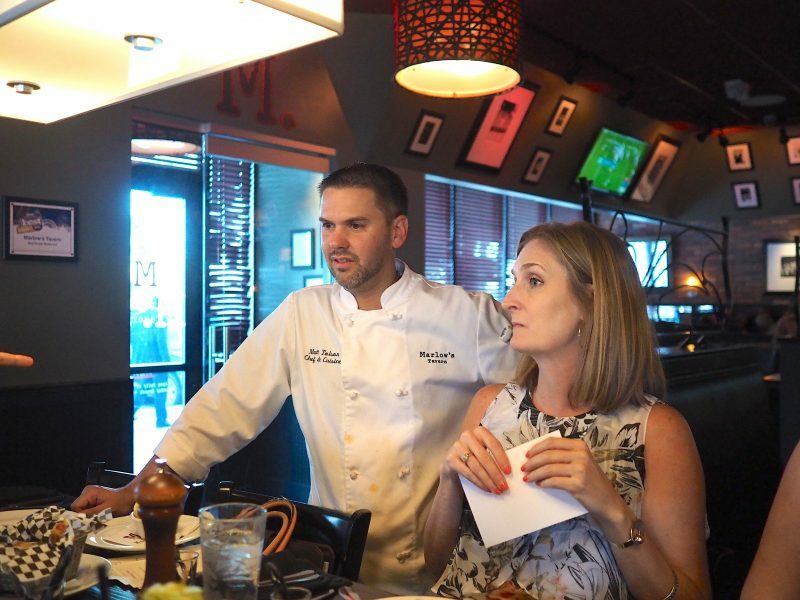 I highly recommend checking out Marlow’s Tavern – Waterford Lakes for any occasion. 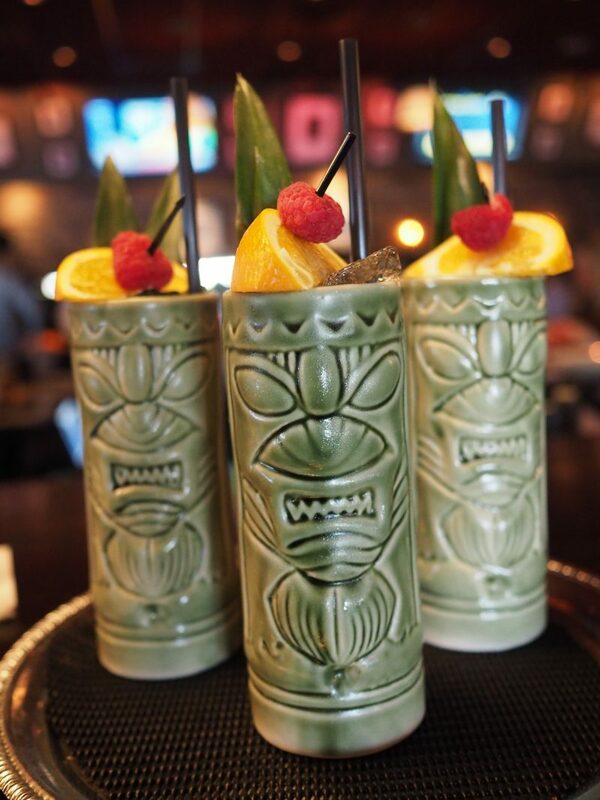 That’s Not Mai Tie – Cana brava rum, raspberry syrup, orgeat, Myers dark rum & fresh lime. 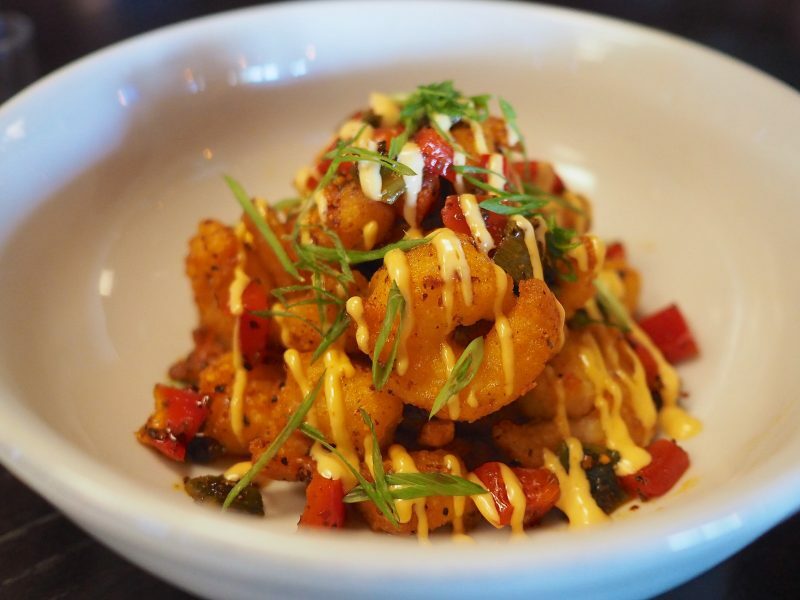 Firecracker shrimp – Szechuan tempura shrimp, red & poblano peppers, peanut, cracklin spicy sauce. It was amazing! 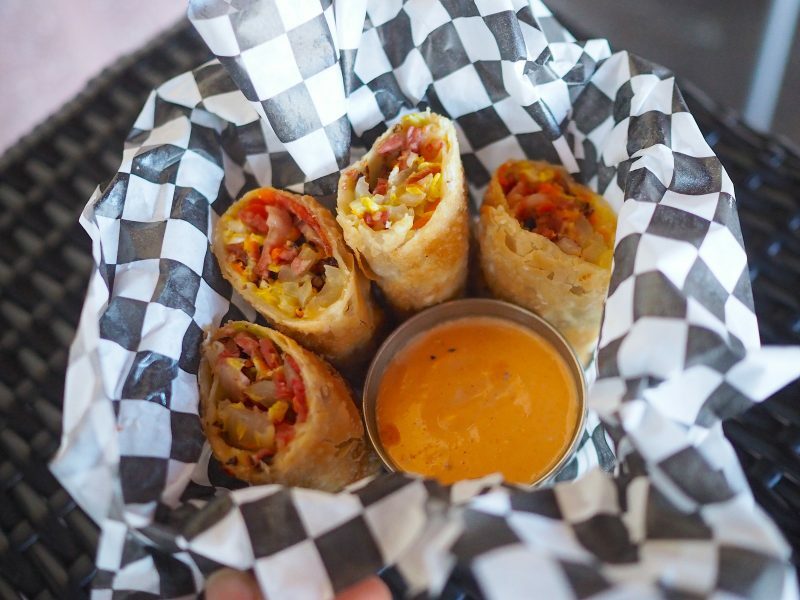 Pastrami egg roll – Montreal smoked pastrami, Napa cabbage, sautéed onions, carrot, smoked thousand island sauce in a crispy egg roll. 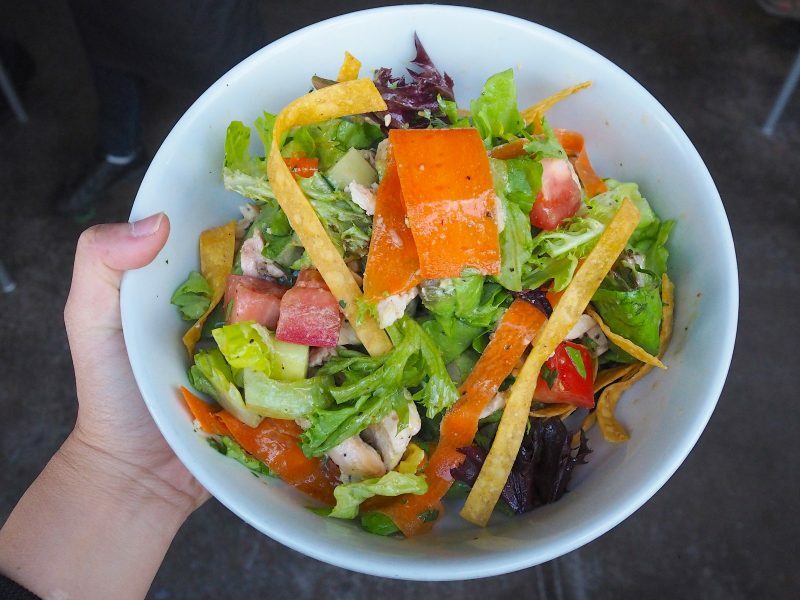 Chicken tortilla – prestige farms chicken, sliced thin, crisp field greens, avocado, tomato, carrot, cucumber, fresh cilantro, tortilla, honey lime vinaigrette. One of the best salads I’ve ever had! 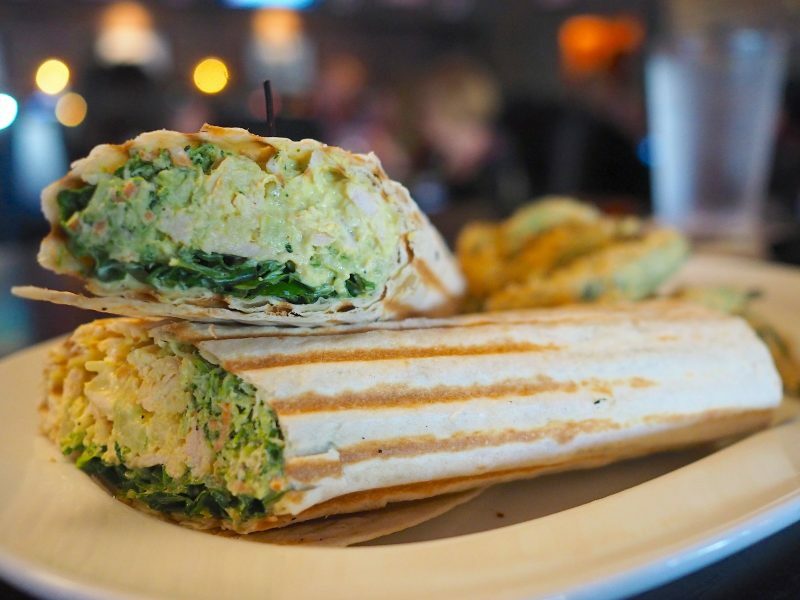 Chicken salad wrap – house-made curry chicken salad, romaine, broccoli slaw, golden raisin, fresh cilantro, grilled tortilla. 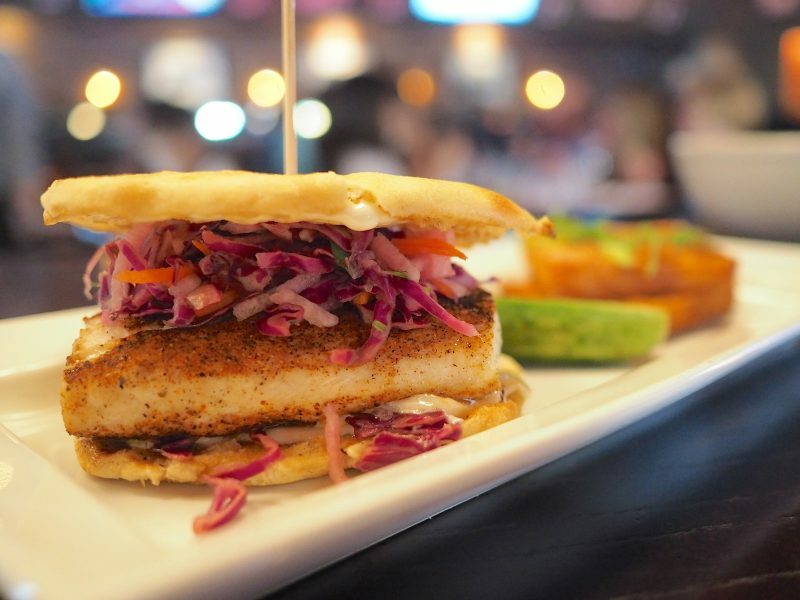 Marlow’s special of the day – Blackened mahi sandwich – served on a ciabatta bun with a jicama slaw and house made citrus aioli. 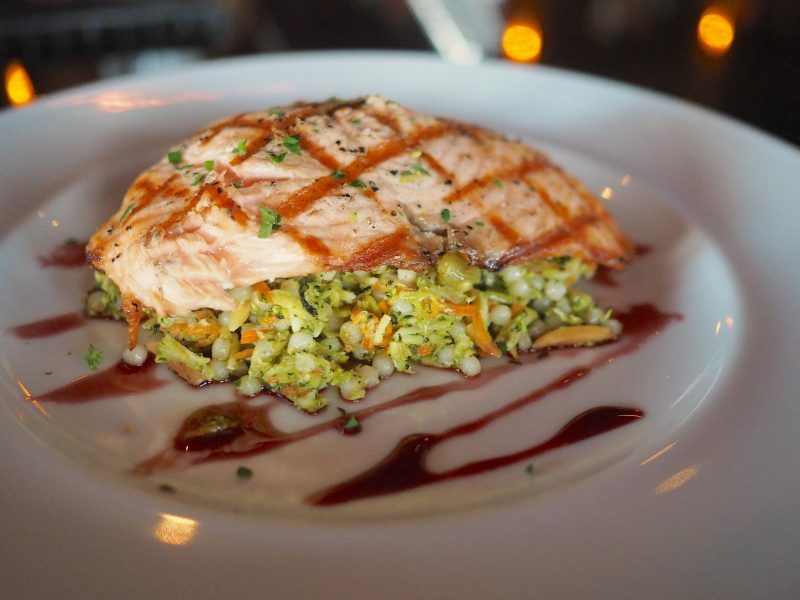 Grilled Atlantic salmon – jumbo cous cous, broccoli, carrot, red onion, golden raisin, parsley, toasted almond & port wine reduction. 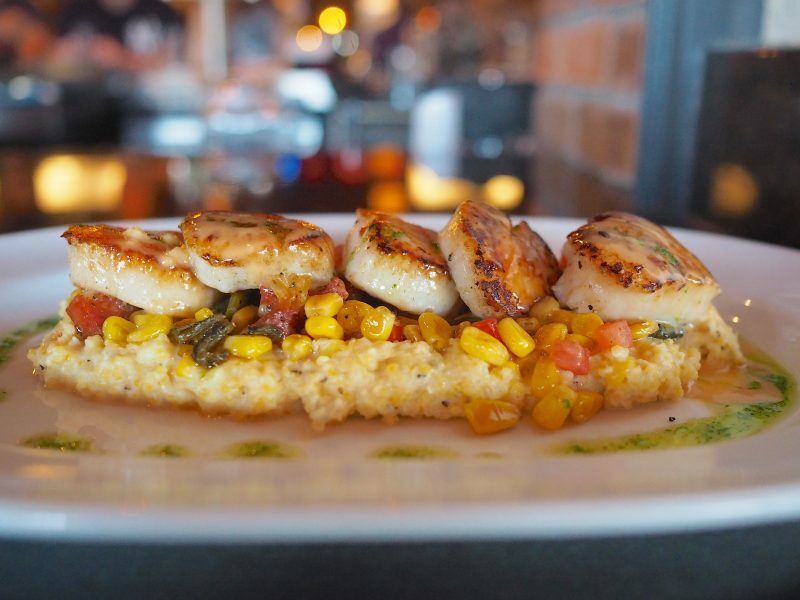 Seared jumbo scallops – simply seasoned & perfectly seared, roast jalapeño corn grits, Spanish chorizo, poblano, roma tomato, roasted tomato fondue, palsied olive oil. 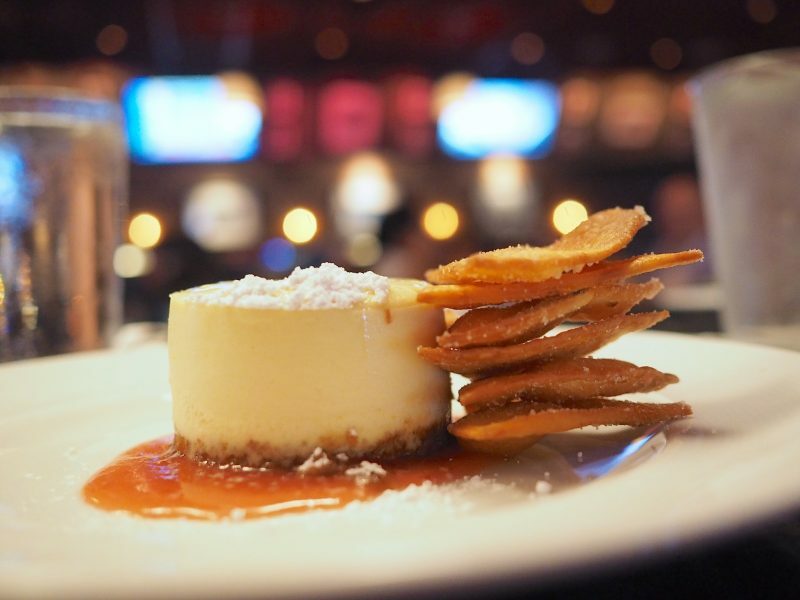 N.Y. style cheesecake – classic creamy vanilla cheesecake, strawberry, powdered sugar and cinnamon crisp. Thank you Executive Chef Matt Tolson for an amazing nine-course meal and superior hospitality! We really enjoyed everything that we ate and thank you Laura Richeson for hosting us! 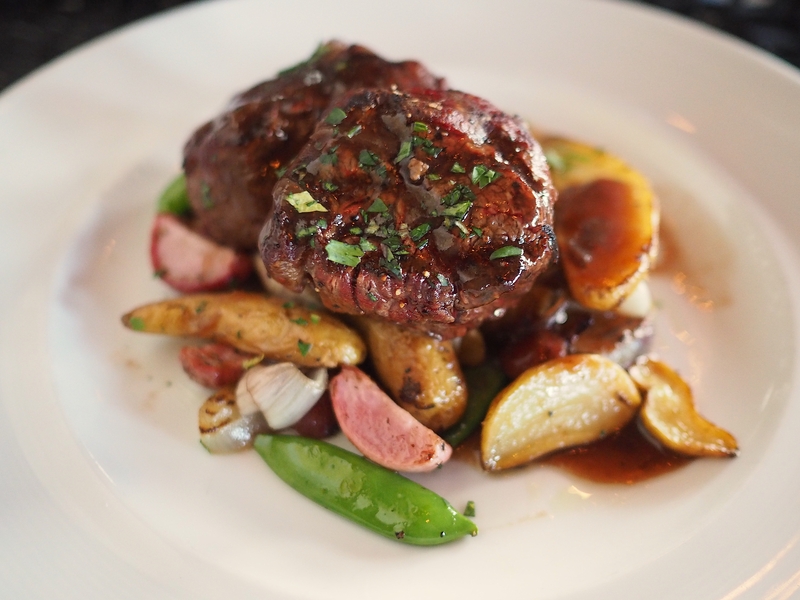 Be sure to check out Marlow’s Tavern – Waterford Lakes soon to taste their new spring/summer menu, it is delicious!